On June 23, 2017, Williamsburg High School for Architecture and Design students put their skills on display in presenting their designs for the Bushwick Hotel lobby. Focusing on aesthetics and customer service, students developed floor plans for the lobby space that will include a reception area, lounge, and restaurant. Through this project, students learned more about the design process, receiving and applying professional critiques, and presenting to a discriminating audience. 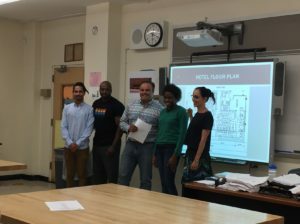 The architecture firm, Gensler, provided ongoing feedback as well as the evaluation of the students’ finished projects. You may download and print the press release below to learn more about this event.